Different business card shapes will have their own special design considerations. While some card designs work well across a variety of shapes, sending in an old project for printing, for a shape different from what was originally intended, can be a recipe for disaster. Different card shapes also tend to be used in different ways by different brands, so the user intent also has to be considered. Here are a few special design tips for each of our business card shapes. You can’t go wrong with a classic business card. But since everyone else uses them, you’ll want to try a few things to make them stand out. - Use thicker, higher quality stocks for a heavier, more important-feeling business card. - Choose uncoated or matte-finished cards for a more tactile feel. - Choose gloss or UV finishes if color vibrance is more important than texture. Square business cards are not as common as standard cards, but still fit in most conventional contexts. - Use these cards with square logos and other roughly equilateral designs. 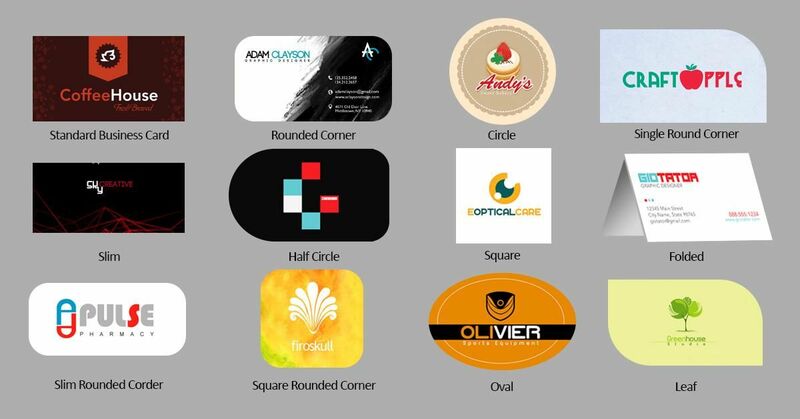 - Circular logos and seals can work well with square business cards too. - If your organization doesn’t have a logo that can fit neatly in a square, consider designing a variant that does. You will be able to use it in a variety of other contexts as well. These cards will really show off your attention to detail. The rounded corners also prevent premature creasing and dents, helping them stay mint for longer. - Like with standard cards, choose thicker stocks for a weightier feel. This will also help enhance the upscale vibe these cards have. - Use our free templates to prevent critical parts of your design from being cut-off at the trimmed corners. These print templates will also make other parts of the print design process much simpler. - You can design decorative borders to better take advantage of the rounded edges with templates. These classy business cards are a daring way to make statement. The proportions are only slightly different from traditional cards, but big enough to create different visual possibilities. - The proportions of this business card are just right for short phrases or longer horizontal logos. - As with traditional business cards, you’ll want a thicker stock so that the card still feels substantial. This is key since you’ll have to compensate so it will still weigh favorably compared to regular business cards. These tasteful cards are definitely not for most traditionalists. As with other rounded corner cards, they don’t crease as easily at the corner as regular cards. - Square rounded corner business cards work especially well with icons and other roughly equal-sided designs. - Use our free templates to better take advantage of the design possibilities offered by the rounded corners. These cards are the perfect thing to leave on tables during events with reserved seats. They can also be distributed like normal business cards, albeit with more info. - These cards have twice the area for your information. This means the principles of brochure and leaflet design apply to these cards to a certain point. - The outside pages can be designed just like you’d design any other business card, if you want. - The inside pages can hide surprises like funny pieces of content, or even coupons. What surprises will you add in your folded cards? - Be sure to use our templates for a more precise layout for your multi-page business card. Leaf-shaped business cards will certainly stand out in nearly any context. - These shape goes well with brands that want to show off an eco-friendly or natural vibe. - While it certainly is perfect for leaf designs, they can also be used with water and fire motifs. - This shape also lends itself well to designs that suggest a flowing movement. - The rounded corners are perfect for round visual elements. Rounded corner slim cards make for a visually striking yet elegant way to pass on your contact details. - Be sure to use our free templates for more precise layouts. - You’ll want a thicker stock so that the card still feels substantial and to highlight the premium qualities this card shape suggests. This is also key since you’ll have to compensate so it will still weigh favorably compared to regular business cards. These round cards are a memorable way to present any business with a classic circle logo. They could also be used as coasters, perfect for seated events. - These business cards will feel better with a thicker stock, especially around the edges. - An icon or round logo will sit perfectly well in these cards. However, their perfect balance also goes well with nearly any visual design. 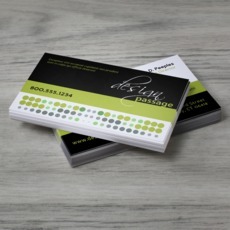 These business cards can easily integrate a round logo or seal on the round side and are great for suggesting movement. This dynamic yet balanced look works well for tech and design professionals. - Many standard business cards can easily be converted into this much more interesting shape. - Use a thicker stock to further emphasize the premium feel. As there is less material than in normal business cards, a heavier stock will also help compensate for the relative lightness. These unusual yet elegant cards are a good match for classic text logos when oriented horizontally, or modified versions of your logos when oriented vertically. -Use durable matte or gloss coatings to help keep your oval cards protected. The single rounded corner on these business cards lends the card’s shape to dynamic designs. They are also a good choice for a brand that want to show off a seal or circular logo. - Add a circular logo or design near the rounded corner as a point of interest. Be sure to use our free templates for creating more precise layouts. - Use this unusual shape to emphasize brands that want to come off as unconventional yet grounded. - Use glossy stocks if you want to highlight colors on clever designs that work with this unusual shape. Perhaps the most useful design tip for any business card regardless of shape is to get the services of a true design professional. It is even better if they understand your brand and the context where the cards will be used. There are a lot of free tools out there. We even offer a free design tool. But without having someone who understands design, your brand, and your customers, you might not get the cards you deserve. With business cards being such a fixture of everyday commerce, professional design is something you owe to yourself and your business.